* New terrain LOD with green landscape from distance. 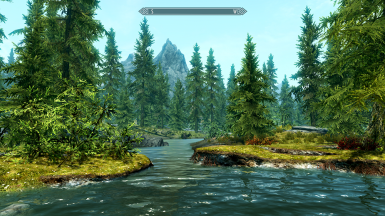 * Fixed a few more tree LOD and removed tree LOD files of other areas of Skyrim. 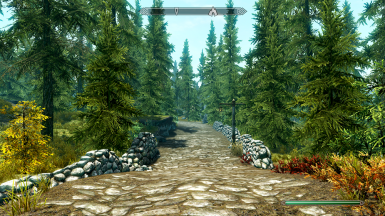 * Replaced some tundra flora and added a few small flora along the roads. 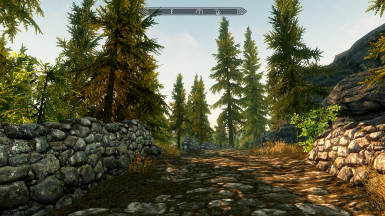 * Fixed a lot of bugged tree LODs (almost all). 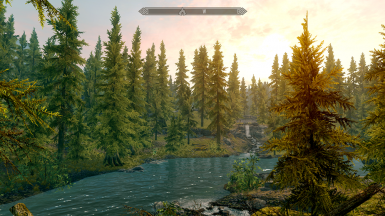 * Birds sounds updated - now with full Falkreath forest twitters. * Fixed some tree positions. * Fixed the Cottage fence near the smelther. 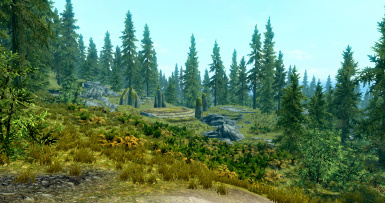 * Added some new trees and undergrowth in small areas (BSA updated). * Changed the Tundra exploration music with the Forest exploration music. * Fixed a few floating trees. * Added a few amount of undergrowth somewhere. * Little terrain fix near the cottage. * Fixed 2 floating trees at -16, 1. * Fixed 1 floating shrub at -16, 2. * Removed 4 barrels in Rorikstead to increase compatibility. 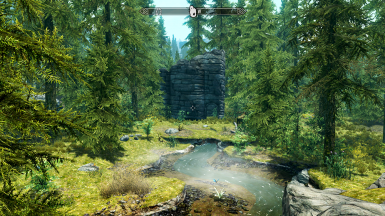 Are you imaging a really, really dense forest spanning in the heart of Skyrim, with a lot of animals, undergrowth, spriggans? Unfortunately, you only have to be strictly confined to the Falkreath Hold to see it. Do you feel also that a glorious forest gives to the game the necessary epic atmosphere? If so, you have to try this mod. 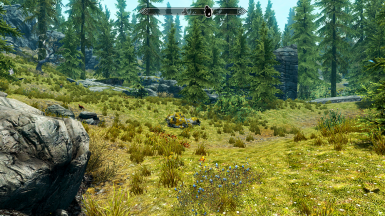 This mod has been somewhat inspired by Forested Skyrim, even with substantial differences. The original uploader, Xilocient, had the brilliant idea to replace the tundra ground texture with a green one, more more suitable for a forest, created for the specific purpose. Unfortunately, he got a tree LOD issue and so he stopped developing his mod in 2012. 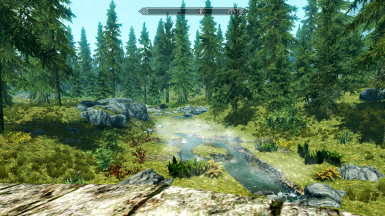 I felt that the texture replacement was a really good idea, so I tried to develop my own mod keeping in mind it, but instead of creating new texture names (as he did), I simply replaced the tundra ones with other existing textures, keeping the same base texture names; after that, I developed the forest avoiding the tree LOD issue, and adding many undergrowth and points of interest. 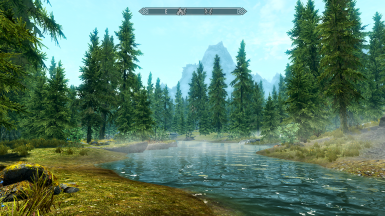 This mod is intended only for peoples that love to lose themselves into a rich and dense forest. If you like open places or if you don't want to lose yourself once you left the road, so this mod is not for you. A version without HF is available under the "Main File" section, complete with .bsa file. Use it instead of the Main File. SKSE and its Memory Patch is suggested for some cases, but not mandatory in any way. 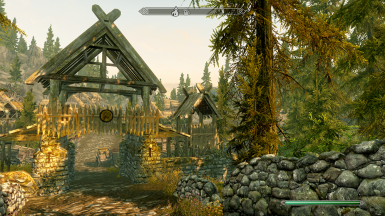 If you are bored to see the desolated tundra of Whiterun Hold and you love the dense forests in the Falkreath Hold, this mod is for you. 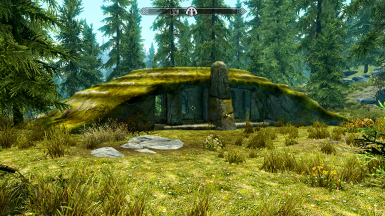 It creates a giant and dense forest Falkreath-style in the tundra plains. 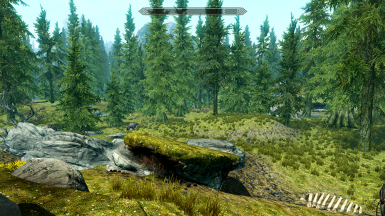 Now you can walk from Whiterun to Rorikstead and more immersed in the shadow of the trees, seeing a lot of ambient animals and feeling the epic atmosphere of an ancient and mysterious woodland. 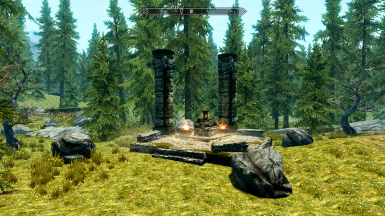 Furthermore, lost in the forest there are many new points of interest with their own Map Marker, such as 3 ancient Nord ruined towers, 3 dwelling ruins, 4 clearings, and 2 groves; plus many unmarked locations, such as ruined pylons, groves, lost treasures, a shrine of Talos, hunter camps, and so on. Lot of preys and predators. Insects and nests. And spriggans, as much as you want. Indeed, leaving the road to travel across the forest can be dangerous, expecially if you don't have a good armory or if you are at the beginning of your adventures. But the curiosity will be probably rewarded: you can discover many small treasures and some nice and cosy places. You can lose yourself into this forest. Some areas are really dense, a true wall of trees; some other areas are instead more open, and you can try to look ahead for some referring points. If you are a hunter (prey hunter, predator hunter, or spriggan hunter) surely you will enjoy this. 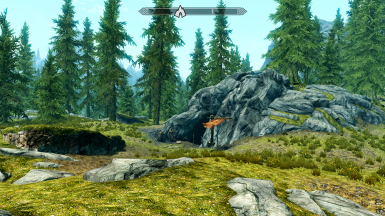 I strongly suggest you tu use Birds of Skyrim (by Qasiermo), to increase immersion. If you like also camping, I suggest Campfire. Camping in this forest can be fashinating. This map shows the exact extension of the forest. 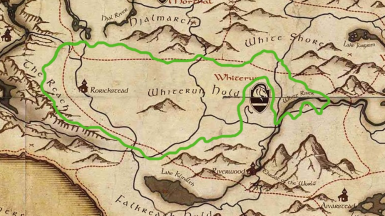 As you can see, it spans along all the tundra region, from the Ritual Stone (the eastern border) to Bleakwind Bluff and near the Rebel's Cairn (the western border). Copy my .esp and my .bsa files into Skyrim's Data folder. 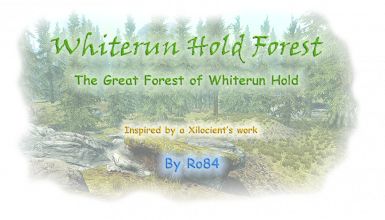 Delete the WhiterunHoldForest.esp and WhiterunHoldForest.bsa files from Skyrim's Data folder. 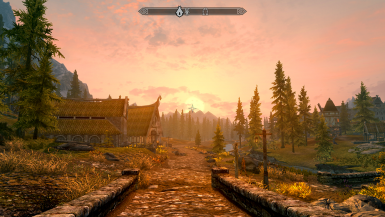 This mod is incompatible with any mod that alters the tundra region, often even in a light way. the specific patch available under the "Optional" section will replace a new vanilla well in the forest into the RND active well. Load after WhiterunHoldForest.esp. Skyfall Estate: some trees will overlap the new building. Anyway, it's really easy to fix them, just select them by console and disable. Load after my mod. 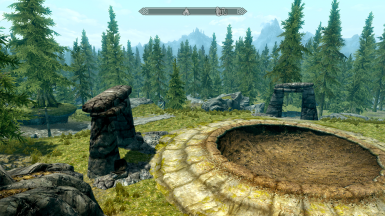 Skyrim Flora Overhaul: not compatible by default. 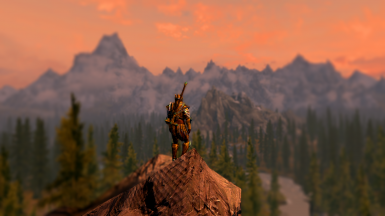 Use DynDOLOD (by Sheson): load this mod before SFO and run DynDOLOD as explained on its page. 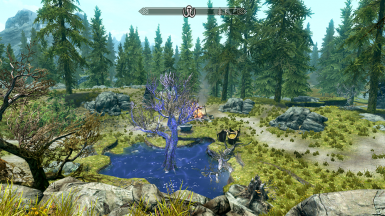 You will get the SFO tree model and your tree placements and the correct LOD for both the mods. 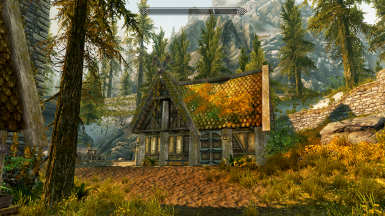 Any house or building in the tundra region: the trees will overlap the building. You can try to fix it by disabling the trees by console. Any other tundra "forestation" project: not compatible. A: Depends on what you intend for "lore-friendly". 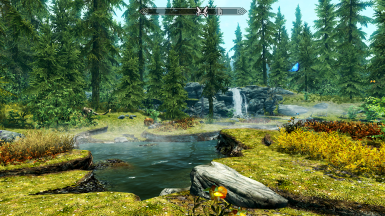 Since there are not strange things or new items/textures, and since the forest has been created having in mind the Falkreath region, it could be consider as "lore-friendly", meaning that you won't lose the immersion. However, from some NPC's dialogue you can hear about a tundra plain near Whiterun, even if its extension is not specified. This can be the only "critical" point, but it's shared with every other tundra "forestation" project. Anyway, I would like to point out a thing: in the World, a tundra region can't have a snowy forest to the north. 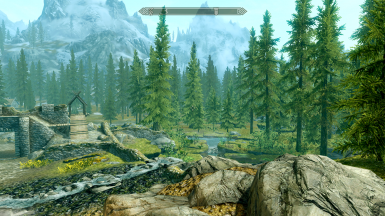 The tundra biome is the last step before the perennial glaciers, so it is really odd that a tundra region like the Skyrim one is bordered to the north by a forested snowy mountain. 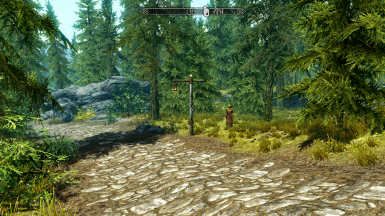 This bugged me more than considering a forested plain all around Whiterun, even if there is no mention in the game. Q: The forest is too dense for my taste. Can you make a deforestation in some areas? A. As written above, this mod is intended only for peoples who love to lose themselves into the forest. So, please forgive me if I have to decline your request. Q: Can you add some dungeons into the forest? 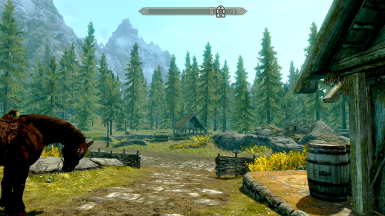 A: The aim of this mod is just to create a forest with only simple open places. Anyway, I don't reject this proposal at all. A: May be. Dipends. 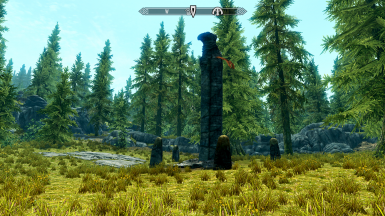 There are no new textures or items, just vanilla ones sorted and arranged to build the forest. But some areas (not all the forest) are really dense. Anyway, there are other Vanilla places that are heavyer to render, I found it. 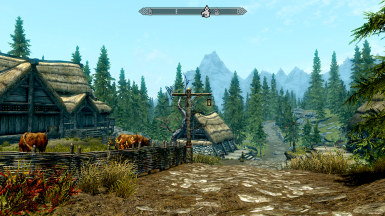 This mod will probably increase the total amount of VRAM usage. Q: I don't use Hearthfire. Can you make a version without HF? A: It's already available, check under the "Miscellaneous" section. Q: Do you plan to add this *random* furniture/showcase/other? A: Depends. I'm open to any suggestion, but I will address only ideas that make sense and are suitable for the ratio of this mod. And, of course, if I'm able to address them! Anyway, I will wait for more than one lone idea, before updating. The .esp file contains over 18000 new objects, included trees, shrubs, rocks, flora and fauna. 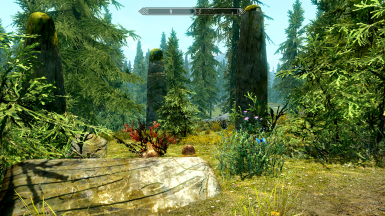 The .bsa file contains the "meshes/Terrain/Tamriel/Trees" directory, with all the new tree LODs. Probably in future I will try to make also the terrain LOD, but indeed the forest density makes it not so important. A new small cottage is available in the forest near Rorikstead. You will find the gate's key in a nearby ruined pylons area, just at the opposite side of the road. A spriggan is watching on this area. The key lies at the top of a destroyed pylon, at the center of the area. NOT AVAILABLE FOR THE NO-HEARTHFIRE VERSION. 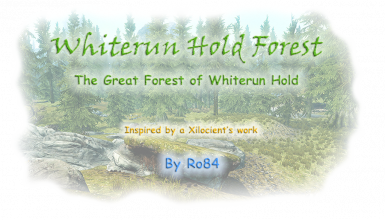 This mod is somewhat inspired on Xilocient mod Forested Skyrim, even with many substantial differences.